When you arrive, please purchase your drinks and food first. With award winning coffee from West Coast Coffee Roasters and espresso from Cafe Virtuoso, our drinks stand on their own as a reason to visit. Your purchase is your admission ticket to the cat playpen. If you don’t want to purchase anything, then the admission fee for the playpen is $5. During our non-peak hours, there’s no waiting to get into the cat playpen. However, should we reach maximum capacity, once you get your drink, we’ll ask you to line up outside of The Cat Cafe along the wall so that the Fire Marshall doesn’t have any problems. When we have a wait, we will clear the cat playpen out after 15 minutes. Then we will give the cats five minutes to relax without any customers in the room. After they get this time, we will bring the next group of 20 in. You can avoid the lines and see the cats when they are much more active by visiting The Cat Cafe during our non-peak hours of 7 to 10. You also get the benefit of not having to pay for parking. We do not take reservations for entry into the cat playpen. However, if you want to adopt a cat from The Cat Cafe, an appointment is recommended and you can email us to set it up. We prefer handling the adoption process after business hours so that there are no interruptions. · Cats are.....cats. If something goes wrong, please don't sue the humans. To be safe, we ask that you sign a liability waiver before you visit. · Cats eat cat food. People eat people food. Let's keep it that way. · You know how much you hate it when you are fast asleep and a stranger tries to smother you with love?! No? Doesn't happen? Ok well, cats hate it. But they don't mind being gently pet as they doze. · Flash photography HURTS. But general photography is awesome. · SO...HOW DOES IT WORK? · Cats! – Hang out with our resident cats in The Den. Expect cat toys, cat cuddles, and cat cuteness. The number of cats will be released closer to launch. All cats will be rescued from the Washington Humane Society. GET EXCITED. · Adoption– Oh wait, did we mention that all cats will be up for adoption?! One of the biggest goals of C&W is to help place DC's homeless cats into amazing homes. The Washington Humane Society will handle all adoptions. · Experience – All food/drinks will be complimentary. Just grab a seat, and at your own leisure, walk over to the drink & desserts bar and grab whatever you fancy! · Online Reservation – You will be able to schedule your visit through an online reservation system. Reservations will be made in half-hour and one-hour time slots. All last minute cancellations will be posted on our Twitter account, so make sure you check that on days that we are fully booked! · Arrival Etiquette – If you are over 15 minutes late to your reservation (without prior scheduling change/warning), your spot(s) will be made available to walk-in guests. If you have to cancel your reservation, please let us know at least 24 hours in advance. · Cover Fee – There will be a fixed hourly cover charge for weekdays and weekends/holidays. If you don't want to hang out for as long as an hour, you will also be able to reserve time in half hour chunks. · Additional Time – If Crumbs & Whiskers is not fully booked during your visit, you are welcome to stay longer than your reserved time! You will be charged in half-hour or one-hour increments after your reservation is up, depending on how much longer you choose to stay. COMMUNITY We are a community space, one where cat, art and book-lovers can come together over a cuppa, buy or exchange books, appreciate art, take painting classes, hold meetings and events, indulge in mild consumerism by admiring and perhaps purchasing our unique merchandise, meditate amongst nature's premier zen-masters (cats), and find new friends. ART Denver Cat Company offers painting classes in partnership with Teller Street Gallery. We are also an art gallery, displaying the works of local painters, photographers and ceramic artists. The works are available for sale. Our current line-up of artists consists of Ashley Joon, Sina March, Michael O'Donnell, and Liz Endicott. BOOKS We double as a used bookstore featuring works of classic literature, non-fiction, YA, fantasy, history, spirituality and contemporary fiction. Patrons are welcome to bring in books to donate as well as buy from our collection. 1. What is a Cat Café? 2. Where is Denver Cat Company located? We are located at 3929 Tennyson St.
Tuesday - Thursday = 10 a.m. to 6:00 p.m.
Friday - Saturday = 10 a.m. to 8:00 p.m.
Sunday = 10 a.m. to 5 p.m.
4. Do you have free wifi? 5. Do patrons get to bring their own cats to the café? No. 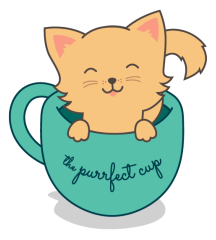 The café will have its own rotating cast of cats that will be available for adoption. Part of the purpose of the café is to provide cat company (see what we did there?) to patrons who are unable to have a cat at home, and also to help our partner shelter, Rocky Mountain Feline Rescue, move its population of cats into permanent, stable, loving homes. 6. Do you charge for entry? Starting Saturday, January 10, we have a $5 cover charge for entry only on Saturdays and Sundays. Weekdays will remain free. In order to sustain our business model and help us take care of our kitties, we do ask that our customers make a purchase if they intend to hang out in the space on weekdays. Read more about our decision to charge a cover here. 7. What about food regulations prohibiting animals in restaurants? Under Colorado's Food Code [PDF] and according to the Denver Health Department, an establishment that serves non-regulated food and drink, is not considered a "retail food establishment" and does not require a license. This also exempts us from any regulations that forbid animals on the premises. We are not planning on serving any non-regulated food and drink and will adhere to meticulous cleaning guidelines. 8. Where do you get your cats? Our partner shelter, Rocky Mountain Feline Rescue, is our source for the kitties. 9. Don't cats hate people? Yes. We work with our partner shelter to choose cats based on their adaptability to the cafe environment. Many cats are extremely affectionate, and the cats at Rocky Mountain Feline Rescue are highly socialized both with humans and other cats. We also reserve a space in the back area of the cafe for cats to retreat to if they are not in the mood to interact with people. Our cats also get adopted very fast (10 adoptions in the first two weeks of being open!) so most of the cats don't have to put up with the environment for too long. We do our best to make sure the social aspect of the café is not unpleasant for anyone involved and that the best interest of the cats is being met. Cat cafés have been an established feature of social life in Japan for over a decade, imported there from Taiwan. The concept is simple: a cat café features cats in residence, with visitors purchasing entry passes, usually for an hour, to enjoy the privilege of hanging out with the café cats. Beverages and snacks are also often on the menu, but there are no hard and fast rules besides the mission to provide kitty companionship to cat lovers. as will Toronto and Vancouver.